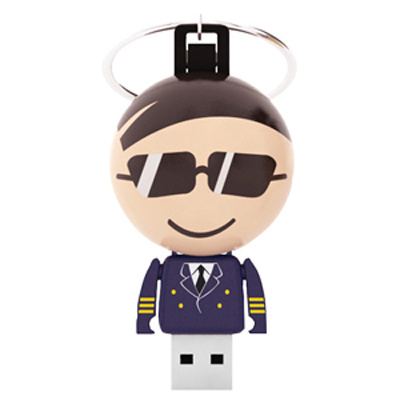 Features: Standard Professional designs, Ball shaped USB people with key chain. Opening the ball releases the body with the flash drive. Grade A memory, 10 Year warranty on data retention, 1 year replacement warranty on faulty manufacture.. Certification: CE, FCC, USB2.0, RoHS. Product Colour: Professional range include Businessman, Construction, Courier, Doctor, Hostess, Nurse, Pilot, Santa, Surgeon . Product Size: 72 x 37 x 37 mm. Print Area: 12 x 4 mm. Print Process: Pad Print. Delivery: 2-4 weeks (indent) from art approval. Standard Packaging: PSL Design Box. Packing Details: 100 pcs per carton, 6 Kgs, 37x25x28 cms. Setups: Included.